"If you don't give us the information we need, I'm sure she will…" Wow. This is quite an epic trailer for what may turn out to be a simple action movie, but damn. That music! Collide is an action-thriller from director Eran Creevy about an American backpacker, played by Nicholas Hoult, who gets involved with a ring of drug smugglers as their driver. 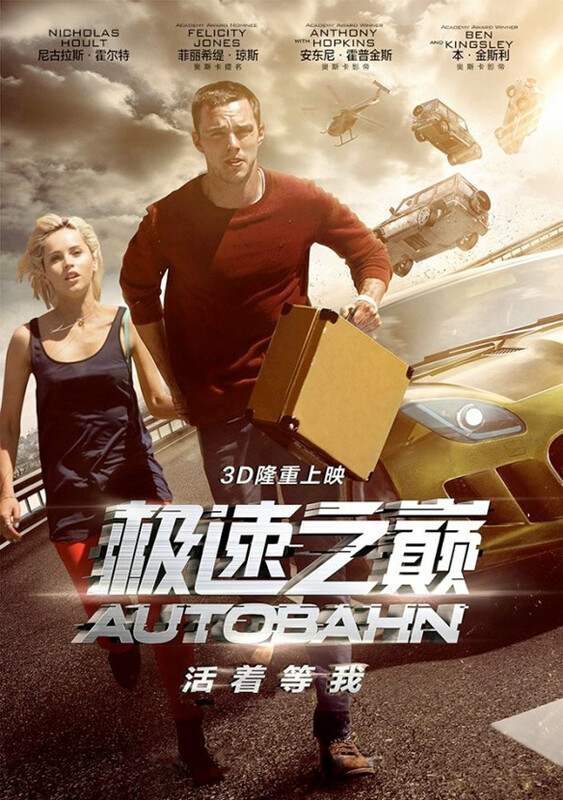 The film's title in this trailer is Autobahn, which is the international title for this, and also the setting of the final action scene where he encounters his employers on Munich's highways with no speed limit. The very eclectic cast includes a blonde Felicity Jones, Nadia Hilker, plus surprisingly somehow Anthony Hopkins and Ben Kingsley as villains. You don't want to miss this tease. Trailer has been removed at the legal demand of the studio. Our apologies. After a heist goes terribly wrong, Casey Stein (Hoult) finds himself on the run from a ruthless gang headed by mob boss Hagen (Hopkins). Now Casey has precious cargo that belongs to Hagen, who will stop at nothing to retrieve it. Left with no choice, Casey calls his former employer and drug smuggler Geran (Kingsley) to protect his long-time girlfriend Juliette (Jones) before Hagen gets his hands on her. Casey sets out on an adrenaline-fueled car chase on the German highways to save the love of his life. Collide is directed by Eran Creevy (Welcome to the Punch, Shifty), from a screenplay by Eran Creevy and F. Scott Frazier. The film has no official US release date set yet, but opens in Europe in early 2016. Your thoughts? Hopkins must be really skint, what is this madness?? So they finally made Torque II huh? Original take it is, now with cars instead of bikes, and set in Europe to make it look exotic for the American public. But the CGI, my oh my...Because of that cheap crap they could pay Hopkins and Kingsley. Hmm very emotional, great trailer music... can't wait to see it. But probably at home. Still looks interesting, and Hoult is a pretty good actor. Never understood how he became famous, but he is. Great VOD material. Not saying it looks bad, but these days seeing films in theaters is getting less and less pleasurable. The song is Aeterna by Two Steps from Hell. I recognized it immediately. Cheers..Was trying to ID it. Superb.